Thank you to Stuart for all his help and allowing my last minute call for a bouncy castle on my daughter's 4th birthday. 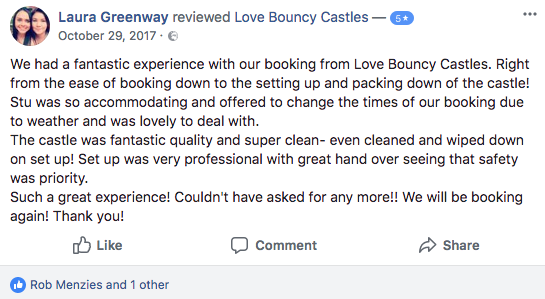 A certain (i won't name) other bouncy castle company that we had booked for over a week with, for unseen reasons had multiple excuses for y they didn't rock up leaving us no bouncy castle for the day. 1 phone call later to #LoveBouncyCastles and Stuart was doing all he could to help us out with such short notice. Due to the other company dragging out there decision to bail on us, we couldn't be helped as it was too late. We organised for the following day with #LoveBouncyCastles and our girls were treated with a surprise at 8:30am with a big Spider-Man on there front lawn. Our girls had a day to remember and thanks to Stuart for all his help. Solid recommendation to anyone looking for a bouncy castle company that cares about their clients. Thanks again. My daughter celebrated her 6th Birthday on the weekend with a love castle and that it was! We had trolls disco with a speaker and lights added in the castle, I haven’t seen any other company do this. Stu was super friendly and professional with his brother in law. The castle was cleaned top to bottom and the safety ran through step by step and it was done in no time! The kids had a ball and loved it. I would happily recommend love Castles to anybody else! Thanks guys!! Words can't express just how awesome my experience with Love Bouncy Castles was. Right from Stuart's super helpful & friendly customer service, to their professional approach to ensure safety, hygiene & quality are a top priority - I could not fault them in any way what so ever. Plus the disco in the castle was an absolute hit with the kids - they absolutely LOVED it! These guys are seriously the best in the business - they don't cut corners and believe in providing quality service over making a quick buck so whilst they may seem a bit more expensive than their competitors, it's simply because you get what you pay for. 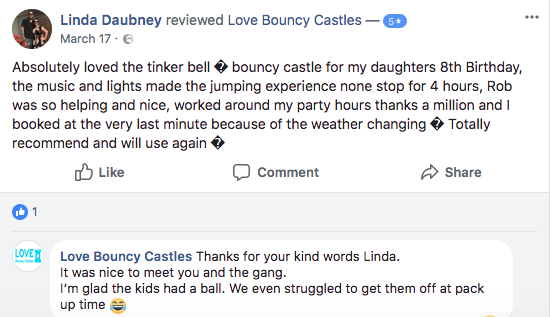 If safety & quality is more important than saving a few bucks the dodgy guys quote you then look no further & call Bouncy Love Castles - I promise you won't regret it!